← BeatSkillz Release Slam Pro & Offer Slam Dawg “Free” For a Limited Time! 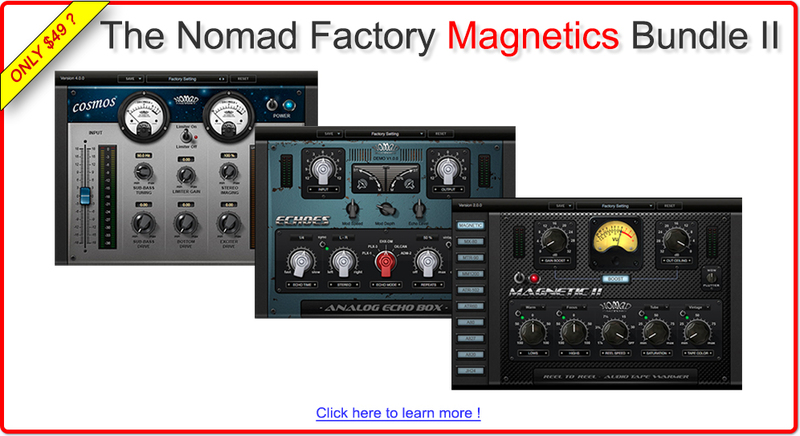 Following the acquisition of the Nomad Factory brand and the succesful launch of 3 great new products since January 2016 (Bus Driver, Drum Tools and AS-Rack), many of you asked if we could run a crazy promo on Nomad Factory’s best selling product, The “Magnetics Bundle II” and so… We did it! From today and throughout September, the acclaimed Magnetics Bundle II will be available on promotion at the no brainer price of ONLY $49 (MSRP $299), and we have made each individual plug-in (Magnetic II, Cosmos and Echoes) available at ONLY $29 each (MSRP $129)! This entry was posted in Plug-ins, Promotions and tagged Bass Generator, Cosmos, Delay, Echoes, Harmonic Exciter, Magnetic II, Plug-In, Tape emulation, Tape Saturation. Bookmark the permalink.